Today is an important day for the country of Finland, marking the 100th anniversary of their declaration of independence from the Russian Republic. To mark the occasion i’m turning to one of Finland’s most celebrated composers, Kaija Saariaho, specifically to an intense song cycle she composed in 2006. Adriana Songs for mezzo-soprano and orchestra, began life in Saariaho’s opera Adriana Mater (set to a libretto by Lebanese writer Amin Maalouf); of the opera’s seven tableaux, she adapted material from the odd-numbered movements – Clartés, Deux cœurs, Rages and Adriana – to form this four-movement cycle. The subject matter is grave in the extreme: set in the context of war, the character of Adriana is raped by a man from her immediate community, becomes pregnant and gives birth to a son, Yonas. To protect him from the truth, Yonas’ family pretend that his father died heroically, but when the truth emerges, in Yonas’ late teens, he decides to track him down and kill him. Eventually, when Yonas finally confronts his father he discovers the man is blind, and decides to spare his life, returning home to his mother. Saariaho has reduced the operatic narrative to just four movements, three sung (all from Adriana’s perspective), one instrumental. In the first, Jardin d’automne (Autumn Garden), Adriana reflects – and, in an understated way, laments – on hiding not just from the world, but from the very city in which she lives; here, only “When the eyes of the city close” can she reveal her voice, her heart and her skin. That Adriana’s lament is understated is due to the words, the melancholy of which is implied; yet Saariaho ensures it is unequivocally heard, providing a context for Adriana bristling with violence. If anything typifies this opening movement, it’s a recurring idea where brief, pained impacts are followed by tremulous, sinewy aftermaths. At times these impacts turn into more heavy blows, in the wake of which Adriana’s words become so earnest they speak as enormous unburdenings, to the extent that their introspective character – in theory, she’s essentially singing to herself – become accusatory barbs aimed outward. Around a minute in, there’s the briefest of reveries – piccolo and glistening strings – and it’s worth hanging on to the memory of this; it’s like a tiny window onto something calm and beautiful that immediately becomes lost in a world of shadow and pain. For much of Autumn Garden, aside from occasional responses and echoes, Saariaho uses the orchestra to create atmosphere rather than interacting with the soloist, allowing Adriana a precarious platform in the foreground, the world around her seemingly poised at any moment to swallow her up. Ultimately, while it remains a soliloquy, the anguish that drives it speaks with equal if not greater force. Who is this stranger inhabiting me? Who is this creature I carry? Who is this creature I feed? Which will my child turn out to be – Cain or Abel? The intensity of the song is ramped up following the first explicit mention of “my child”, as if acknowledging the child as anything more than just an idea is almost unbearable. The music’s pervading disquiet is systematically turned into an atmosphere of ominous dread, that falling semitone motif, almost chirpy earlier, becoming lost in a sequence of obsessive repetitions, like the magnified and distorted sound of heartbeats. To the last it retains a quality of beauty but, as before, the pain permeating everything continuously militates against it. In many respects the work’s instrumental third movement, Rages, is a more extreme rendition of the poles of lightness and weight heard in Je sens deux cœurs. Here, the descending motif is abstracted into a network of tickling staccatos, the repetitions into spasmodic pummelings. This is all the first few minutes consist of, an increasingly angry tussling between these ideas, and even when it finally settles a bit, flecks of melody emerging from the carnage themselves become transformed into the building blocks of a whole new slew of even more insistent hammer blows. This culminates at the end in a clarinet-instigated cry of something for which words could never be adequate, after which the music doesn’t so much soften as collapse, exhausted and overwrought. It’s clear from the title of the work as a whole that this movement should also be heard as one of Adriana’s songs, which is interesting in light of the previous two movements. Not so much in the second but in the first movement the anguish i spoke of often sounds akin or at least perilously close to anger – the orchestra hinting at and partially letting out what Adriana doesn’t directly say – but here in Rages we finally catch a raw glimpse into Adriana’s complex emotional state. Of everyone in the narrative, she above all deserves more than a little rage. This movement also provides something of the qualities of an interlude, taking us from before Yonas’ birth to the time 17 years later, when Adriana is waiting to find out if he has murdered the man who raped her, his father. As well as being the longest, final movement La vie retrouvée (Life Regained), is also the most emotionally heightened of the cycle. 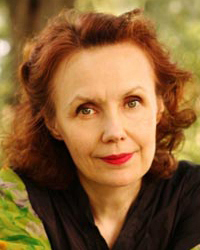 As in the preceding movements, as soon as the mezzo-soprano begins to sing, the orchestra, having set up a world of portentous swells and thuds, falls silent; it’s yet another sign of the way Saariaho employs the orchestra to provide context and support (and, as noted, occasionally a mouthpiece for what she can’t or won’t say) rather than anything antagonistic. In the first part of the song Adriana reflects on the boy’s infancy, her words about him in the cradle accompanied by strange, plaintive, falling cries in the distance. She goes on to express the anxieties that plague her concerning whether Yonas will have inherited the same despicable character traits as his father, or more closely resemble herself, reflecting too on the doubts and suspicions of the community. It results in a brief outburst, one of the work’s last, from which Saariaho pulls everything back, beginning a trajectory that will lead to the very end, no longer characterised by eruptions and volatility but by a kind of resigned discomfort. There are brief, temporary, hints of gentleness and stability along the way, but the denouement of Adriana Songs could never be an easy or happy ending. The reason for Yonas choosing not to kill his father, though motivated in the opera by disability, is left open in Adriana Songs, and we can simply infer that, whatever the reason may have been, he has proved himself to be something better than Adriana had feared. But in place of contentment, the music provides a kind of exhausted relief, Adriana’s voice now exhibiting none of the strength or passion heard in the first two movements. In the orchestra a melodic idea is continually moved around, always getting slower, almost becoming dronal, yet a closing shift in the bass undermines the music’s behavioural and harmonic stability; this coda epitomises the whole movement, even now primarily coloured by black anguish. Yet while Adriana Songs can’t bring resolution, the point where it ends is pivotal: only once the final bar has faded can Adriana’s relationship with Yonas properly begin, and their wounds begin to heal. This performance of the UK première of Adriana Songs took place in City Halls, Glasgow in October 2012, performed by mezzo-soprano Patricia Bardon with the BBC Scottish Symphony Orchestra, conducted by Matthias Pintscher. Sous les plis de mon coeur. Sous les plis de ma peau. Non, je ne suis sûre de rien. Un deuxième coeur qui bat tout près du mien. Qui est cet étranger qui m’habite? Un frère? Un autre moi-même? Un ennemi? Comment répandre l’un sans répandre l’autre? Je le prendrai contre mon sein pour le nourrir. Qui est cet être que je porte? Qui est cet être que je nourris? Mon enfant sera-t-il Caïn, ou bien Abel? Tu ne méritais pas de tuer. Je me demande si tu serais un jour capable de tuer. Pour que tu sois aimant, et réfléchi, et droit. Ou bien feras-tu, au dernier moment, un pas en arrière? Le sang du meurtrier s’est apaisé en côtoyant le mien. Nous ne sommes pas vengés, mais nous sommes sauvés. Under the folds of my heart. Under the folds of my skin. No, I’m not sure of anything. A second heart beating close to mine. A brother? Another self? An enemy? The blood of the victim and the blood of the aggressor. How can you spill one without spilling the other? Feed him at my breast. Who is it I carry? Who is it I feed? Did not deserve to kill him. I’ve wondered if you were capable of killing. Weighing your cries, your expressions, your movements. That blood was neutral and silent. For you to be loving, thoughtful and honourable yourself. I was tortured with doubt. Or, at the last moment, would you draw back? The murderer’s blood has been calmed by flowing near mine. Is found again at last. We are not avenged, we are saved. Come close and put your arms around me.